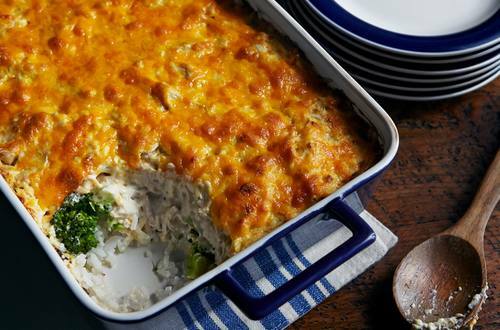 Is there anything more comforting than a chicken and broccoli casserole? Try this easy creamy casserole recipe at your next party or just make it for the family! 1 Preheat oven to 350°. Grease a 13 x 9-inch baking dish with butter or no-stick cooking spray. 2 Spread the rice in an even layer in the baking dish. Top with broccoli. In a large bowl, mix the chicken, soup, half the cheese, Hellmann's® or Best Foods® Real Mayonnaise, sour cream, lemon juice, salt and pepper. Pour this over the broccoli and top with remaining cheese. 3 Bake 40 minutes. Remove from oven; let stand 5 minutes before serving.